Before reading into the following figure, it's important to understand the Total Fertility Rate (TFR), which is the average number of children a woman would have over her lifetime. The x-axis cuts at 2.1 to signify the replacement level of the TFR (i.e. 2.1 kids to replace a mom and a dad), the 0.1 addition is to quantify the infant mortality rates of a country. I love studying population trends. Its one aspect of economic development that's actually beyond policy control (besides child abortion and contraceptives) - unless you're Singapore or China. Population is generally a good thing for development, as it represents additional labour and inherent consumption in the economy. 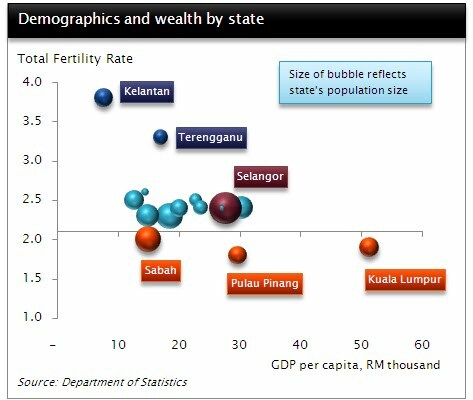 An economic paradox states that women in richer economies tend to have fewer children (but then again have a read on the many, many reasons why this situation may happen), and Malaysia is no different it seems. I'm not going to get into the discussion of what causes what just yet. That said, I think the Sabah TFR stats may need revising. ...and the Department of Stats website seems to have changed...for the better! Go have a look.